Blackstones yesterday (January 3) dismissed manager Phil Gadsby and replaced him with former Whittlesey Athletic boss Andy Lodge. Gadsby had been in charge at Lincoln Road for 20 months, but, after a decent first season in charge, good results had been hard to come by this term. Stones are currently 16th of 20 in United Counties Division One with six wins from 24 matches. They lost 2-0 at home to local rivals Bourne in their last outing on Boxing Day. 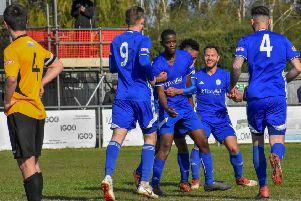 Lodge steered Whittlesey Athletic to promotion from the Peterborough Premier Division to United Counties Division One last season. Whittlesey also won the last two PFA Senior Cup Finals at the ABAX Stadium. Lodge has been out of the game since Whittlesey, who had made a promising start, pulled out of the United Counties League after just 10 games after failing to find the funding to upgrade their Feldale Field base. Lodge, who enjoyed a distinguished playing career which included a spell at Boston United under Steve Evans, will be in charge for the home game with Irchester on Saturday (January 7).